A time of grandiose and splendour, the "Belle Epoque" as it was also known may have been short-lived but it brought with it a breath of fresh air. Fresh air that can be easily applied to your home with just a few key changes. Period interior design is very on-trend at the moment and Edwardian style provides you with the opportunity to achieve an alternative look in your home's interior. Should you be choosing to transform your home, we believe the dining room is an excellent place to start. 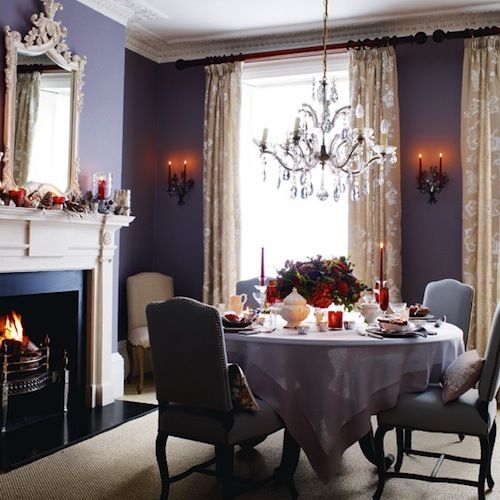 In the past there was a significant focus on mealtimes, so the dining room was a focal point of the home, follow our tips below and add the Edwardian experience to your own dining room. Usually reproduction pieces, Edwardian furniture was known for reviving styles from previous eras and was largely an eclectic marriage of styles and influences. Whether you choose baroque, Art Nouveau or Tudor pieces, the key thing to look out for is furniture that is smaller and less bulky. Edwardian furniture was known for being a departure from the large, heavy and formal Victorian furniture that preceded it. For a truly Edwardian look, consider furniture made from mahogany or lighter materials such as wicker or bamboo. For an authentic look in any interior, choose highly polished wooden floors that are stained with an oak coloured varnish. 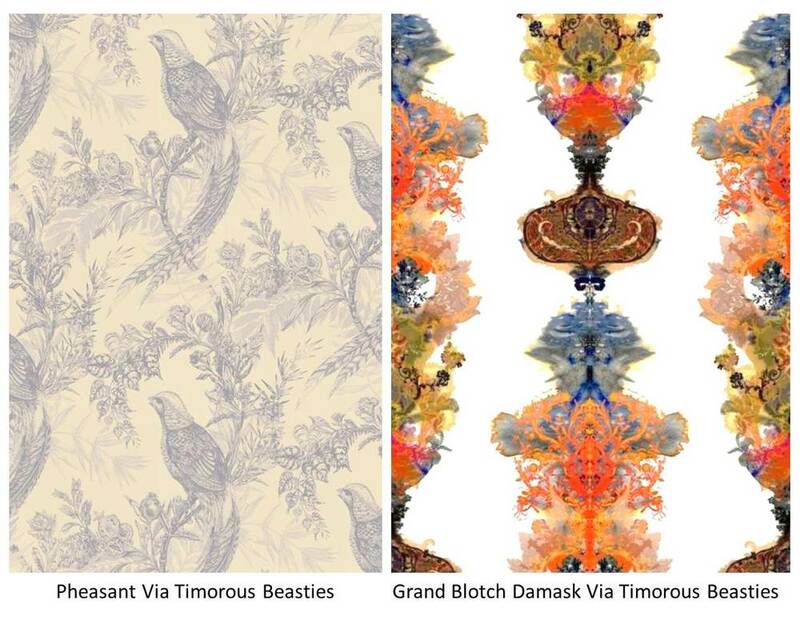 When it comes to wallpaper, choose a design that adds a breath of fresh air to your interior. Perhaps consider paper that features floral interior designs such as roses, wisterias or sweet peas, or perhaps a striped design. When it comes to wall interior design, a key Edwardian look was to break up the wall with a dado rail. Perhaps choose to emulate this and paper half the wall with a patterned design and paint the rest of the wall. Continuing the floral theme, choose pastel colour schemes and floral colours. Think lilacs, leaf greens and primrose yellows. Electrical lighting was relatively new in the Edwardian period and therefore was designed to be grand. Fabric lampshades with frills and tassels, smoked glass and ceiling roses are all very true of the period. Again still a relatively new innovation, radiators were a big deal during the Edwardian period and were designed to be a talking point of the home. Take inspiration from these reproduction cast iron radiators and choose updated colours to contrast your space. These reproduction radiators stay true to Edwardian designs but are equipped to modern plumbing and interior design standards. This color combination is very pleasant because subconsciously it reminds us of soft flavors and the subtleness of nature. As part of the green family 'mint' is a restful hue promoting concentration. 'Vanilla' has the properties of both clean-white and happy-yellow, favorable when making a soft palette. Inspired by the velvet checkered pattern I like to keep it in the family and contrast with bronze, think of toasted almonds. Lastly add a soft touch of blue-violet, a stable and relaxing color like its blue parent. A great example of a calming mint palette is this bedroom by Tobi Fairley. It is both romantic and yummy at the same time, much like mint chocolate after dinner. Hello, everyone! It’s Marie here with a guest post from Arcadian Home blog, a fabulous place to find interior design inspiration including great decorating ideas for everything from beautiful folding screens to glittering traditional chandeliers. Those of you who are regular readers of Avanzato Design blog are already familiar with the always interesting and informative monthly palette trends series. Inspired by Vincenzo’s obvious love of color, we've pulled together eight of our favorite color-infused traditional dining rooms to share with you today. Please enjoy! A traditional dining room with warm wood flooring is exquisitely dressed in soft yellows and accented with inviting lime-yellow end chairs. Warm buttery yellow walls create an appealing background for this cheerful and slightly feminine traditional dining room. Drapery panels in pretty pink hues work beautifully with a large floral pattern on the chairs. Charming table decor gives this space a Sunday brunch feel. Minty greens and blues bring a fresh modern take on traditional with a Chinoiserie twist. The vibrant wall color works beautifully with the pure white woodwork above and below. Warm brown tones pair work well and tone down the bright orange fabrics in this updated traditional dining room. A beautiful mix of dining chairs includes two in chocolate brown velvet. Brilliant turquoise brings this spacious dining room to life. Using so much color might seem like a bold design choice, but works here without overwhelming the room. 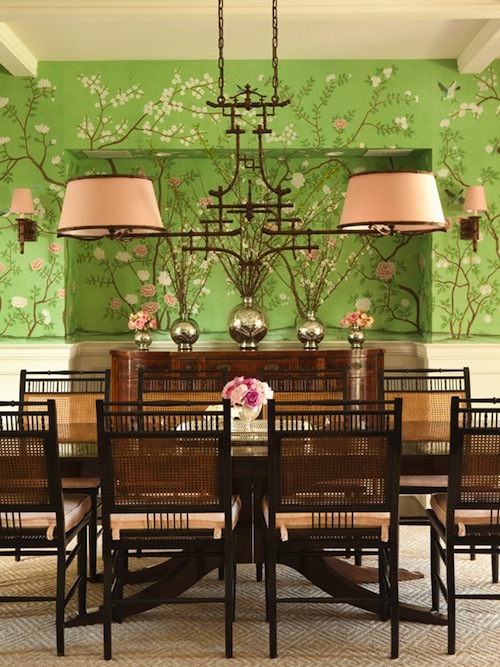 Wallpaper in white and pink on green brings a lively feel to this otherwise sedate dining room. The pretty traditional pattern creates a beautiful background for the wood furnishings in this space. Rather than the expected buffet lamps on the antique sideboard, silver vases of blooming branches mimic those in the wallpaper. 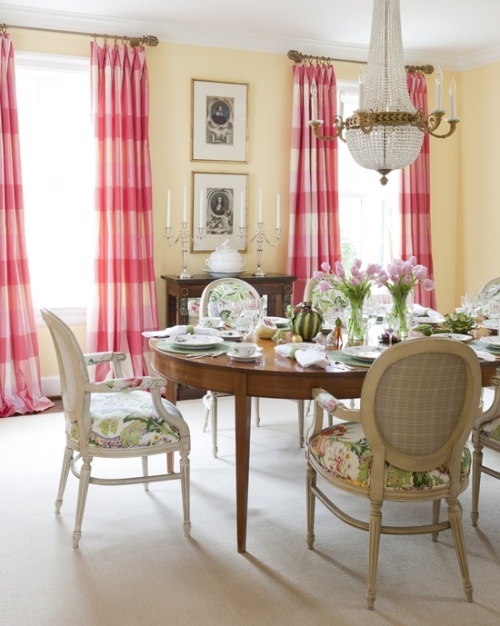 Vibrant pink is exquisite in this beautifully appointed traditional dining room. The deep pink hue is at once powerful and appealing. It must look even more stunning after dark in the glow from candles, wall sconces and chandelier. What do you think of these traditional dining rooms? send us your comments and discover more home decor, accessories, and modern pendant lights at our blog!